So I’m in the middle of a move. Currently packing my life up and making my way to Missouri. Moves are so dang hard, and I swear they never get easier. The stress of trying to neatly pack your life into boxes, topped with the chore of canceling the various utility accounts, oh and let us not forget about pausing the mail (paused writing to check that off the list, yay! ), cleaning your now empty home, and last but not least, saying goodbye. Goodbyes amplify the awfulness of moving. I’m unbelievably terrible at saying goodbye. I’ve been known skip out on even saying it, opting to pretend I’ll see everyone tomorrow. There was really only one move that caused me to break down in tears. As a kid it was my normal to pick up my life and relocate. I didn’t like it, but I accepted it. I always try to keep it positive when I move. I research things to look forward to at my new location. Honestly, at this point in my life, the change of scenery every few years is kind of nice. One thing I’ve grown to love is finding a new derby team. It almost feels like I have a family waiting for me in every state. I figured this move was a perfect opportunity to put the DerbyListing website to good use. If you see a team that is missing, add it. If a team has a new Facebook page or they no longer exist, correct it. This is a team effort! Share derbylisting.com with your friends, league mates, and derby mates around the world. The more people who know about this asset means more eyes and ears out in the derby world that can help contribute to the site. The website is made so that visitors can make corrections and additions. However, to ensure erroneous data isn’t added (wiki style) all corrections/additions are vetted by the one and only, Richard Hurton, before it is made visible to the public. Once a change is made visible to the public, it is announced via a Facebook post. Every contribution makes The List more accurate. Please help our derby community. Please note, that my opinions, within this blog post and all future blog posts, are just that, my opinions. If you disagree with anything I say, please feel free to engage in respectful dialogue in the comment section below. I can also be reached at jukes@derbylisting.com. Thanks for joining me on my blog-venture!! Sometimes I get these grand ideas to try new things, then it suddenly hits me, that it would require me to do things outside of my comfort zone. Old me would pitch an internal fit (current me is still a nervous human, but far less dramatic). That’s when the anxiety and self doubt would usually kick in. So many thoughts would pump through my brain, and most of them would be negative. The same was true when I decided to try roller derby. The internal war I went through, might as well have been a reenactment of WWII. The mind is a tricky thing. The Monday after I saw my first bout, I worked up the courage to go to a practice. I am very skilled at getting lost, so I left my apartment early. However, this was one of those rare occasions when I didn’t get lost, so I arrived at the practice venue with plenty of time to spare. I strongly dislike arriving first at events. It gives me time to over think some more, and potentially bail out. I sat in my car, listening to the radio to calm my mind. 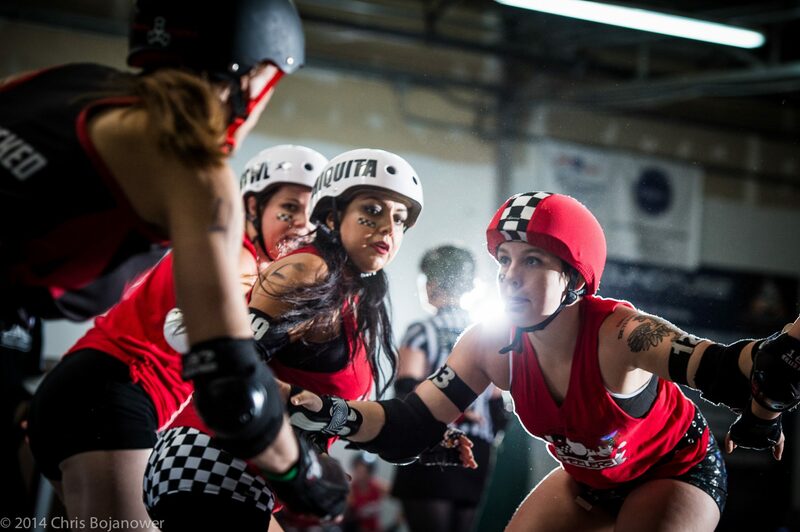 One by one, derby women parked, grabbed their gear, and walked inside. I sat in my car like a creeper, and watched them mosey on in. I sat in my car, till five minutes after the practice start time, and decided it was time to walk in. I counted to three, with three being my cue to open my car door, and sat there frozen. For me, counting to three doesn’t always work on the first try. In this moment, it took three rounds of counting, to finally open my car door and step out. I timidly made my way inside where derby ladies were strewn about the floor putting on their gear. I awkwardly hovered partway between the entrance and the group of women. Finally, after what seemed like years, someone walked up to me. “Hey there! Can I help you?” Flight mode was activated, with what courage I could muster up I held my place and answered, “Hi…yea…I saw you guys skate on Saturday…and…umm…heard the announcer say to show up at a practice…to join.” The skater smiled, “I’m so happy you came! Well hey, we’re actually doing a bout review today, so it will be kind of boring, with not much skating. But how about you come back Wednesday. It will be a full practice on skates. Do you own skates?” Once again my awkward response, “Oh, okay…ummm…no…I…I don’t have skates.” The skater smiled, I think she sensed my nervousness, “Okay, don’t worry about it, we’re at a skating rink, so you can use a pair of the rentals, for free. We also have a bag of funky gear you can borrow from. I see you have a mouth guard, so you’re all set.” I smiled, fumbled around with my mouth guard, “okay, sounds good. I’ll come back Wednesday.” I scurried out of the venue. I made it outside and took a deep breath. Hard part done, right? No, not even. It was almost soul crushing, that I had showed up on a non skating day. Waiting another 48hrs, gave me more time to decide it was a dumb idea. They didn’t know my phone number, or know my name, and they probably wouldn’t even remember I stopped by. Therefore, I could slip back into my comfort zone, without anyone knowing, right? How many of you think I went back on Wednesday?? I’ll save that answer for another post. Right now, I want to talk about having a league plan (a plan for what?). A plan for, what to do when a roller derby wanna be stumbles into the door. Do you turn them away? Do you get their name and phone number, then hit them up when a fresh meat program starts? Do you stare at them awkwardly and wait for them to melt away? There’s no right answer. There’s just, what works for your league. Some leagues have open recruitment throughout the year, so when a stray walks in, you can get them set up and ready, right away. If your league is hurting to recruit bodies, then you best have a plan to trap that nervous little newbie before they run away. Other leagues can’t really afford to train a new kid at a random practice during the week, and that’s fine too. However, if that’s the case, maybe get their name and contact info, then turn them into an NSO, until the next fresh meat session. It’s also, a good idea to plaster your social media sites with future skater recruitment dates. Most importantly, you just need to have a plan that works for your league. Make sure everyone knows what the plan is, or perhaps take it a step further, and have a few skaters who know the plan really well. Then make sure they are the ones who scoop up random folk, who walk in interested. Just some food for thought.